At Wallis Annenberg High School – part of Accelerated Schools, a network of privately-run charter schools in the Los Angeles South Central area – teachers and staff are making history as the first charter school in California, and the second charter school in the nation, to go on strike, following the charter teachers who went on strike in Chicago at the end of 2018. After facing months of hostile bargaining with their employers, teachers and staff went on strike in solidarity with the wider public school strikes of 2019. 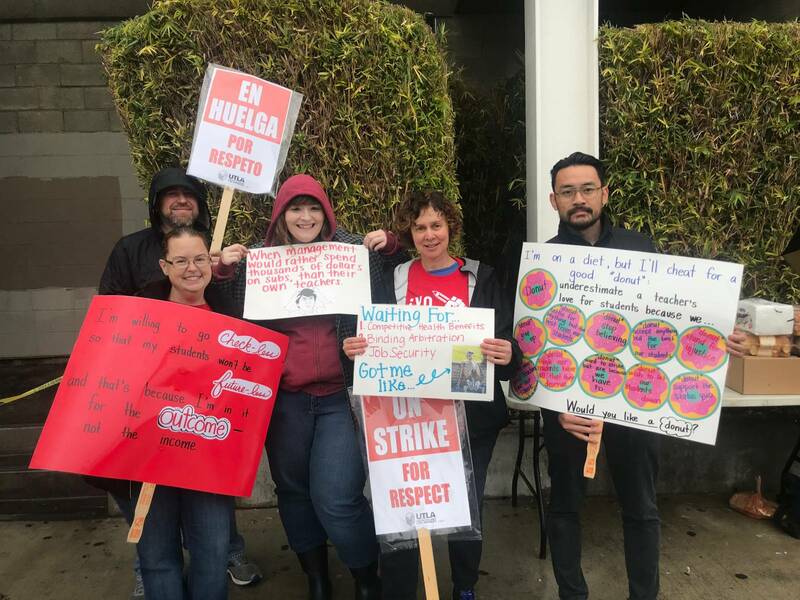 Over 100 teachers, school staff, and supporters of the strike gathered on Main Street to make their demands for the third day in a row (Accelerated employees joined the strike a day after UTLA began on Jan. 14). Negotiating with the charter company rather than the school district, the teachers have had to face threats of disciplinary action against their students, but haven’t backed down. Why is this step so significant? California’s relationship to charter schools is complicated. The state is home to the most charter schools and charter students in the country; one in ten students is enrolled in a charter school. These schools take public education funds, yet are run like private business enterprises. Although only about 3 percent of the state’s charter schools, representing 25,000 of the charter school students in the state, are explicitly operated by for-profit companies, large financial interests are able to direct the operation of the vast majority of the remainder of “non-profit” schools. “Non-profit” charter schools can still be extremely profitable to their investors, with the real estate and contracts for management staff, food and books associated serving as their own kind of incentive. Hostility towards unionization (only around 11 percent of charter school workers are unionized nationwide) in the charter school industry means that wages are lower and benefits uneven. Lack of job protection means that teacher positions often have high turnover. Despite the less than favorable conditions for organizing among charter employees, progress is being made, and Accelerated Schools are now one of eleven charter school networks newly represented by UTLA in Los Angeles. Charter schools see a great deal of investment and political support from the super-rich, with a school like Annenberg being funded by the corporate heiress Wallis Annenberg, President and Chairwoman of The Annenberg Foundation. Other prominent supporters of the charter school “movement” include Bill Gates, the Walton family (owners of Walmart), and Eli & Edythe Broad, founders of the massive KB Homes housing monopoly, as well as a host of other large foundations and corporations from Ford to Hewlett-Packard. These backers have given literally billions of dollars in lobbying, support for media and public relations campaigns, and investment to turn California and the country’s public school systems over to private ownership and administration that promises social justice and greater efficiency but really just delivers inequality and financial gain for the few. The teachers demonstrated their power as they continued to picket, with none of the teachers entering the school and many students showing up on the picketline from the first day of the strike on. At least two substitute teachers have refused to cross the line so far. The unionized workers have been in negotiating and bargaining for over 20 months, fighting for four concrete demands: a salary table, competitive benefits, due process to protect teachers from firing and a binding arbitration agreement (to help settle disputes between the employees and employers). The school board resisted on every point, offering only the salary table as a small, but tangible improvement. Negotiations continued with mediated bargaining into October, but the board continued to reject their employees’ demands. Upon reviewing all sides, even the fact-finding chairperson sided with the employees on the issues of job security, arbitration and benefits, given the rising cost of living in Los Angeles. The school’s refusal to grant these basic demands led directly to the current strike. No matter how transparently corrupt the school’s CEOs and investors may be, the teachers at charter schools are workers like any others. The Party for Socialism and Liberation stands with the teachers, staff workers, and students as they struggle for the rights that all of us should have: to be able to live a life free from the worries of the cost of living and protection from the abuse at the workplace. This struggle continues, until all working and oppressed people globally have the opportunity to spread the gift of education to the youth without any barriers. Education is a human right!